UNIGINE offers a flexible and extendable Import System, enabling you to import whole scenes as well as selected scene components from any external format and use them in your projects. Runtime import feature is not available for Entertainment SDK edition. The structure of the Import System is shown below. It includes Import Manager and a dynamic set of importers and processors for various external file formats. Import Manager is used to create and manage importers, processors as well as to directly import files in non-native formats, if an importer for such files was previously registered. Importer is a module used by the Import System to bring the data stored in various non-native formats to UNIGINE, it generates UNIGINE objects on the basis of metadata extracted from the imported file. A single importer can be used to import multiple external file formats (extensions), but there shouldn't be two or more importers registered for a single file format. 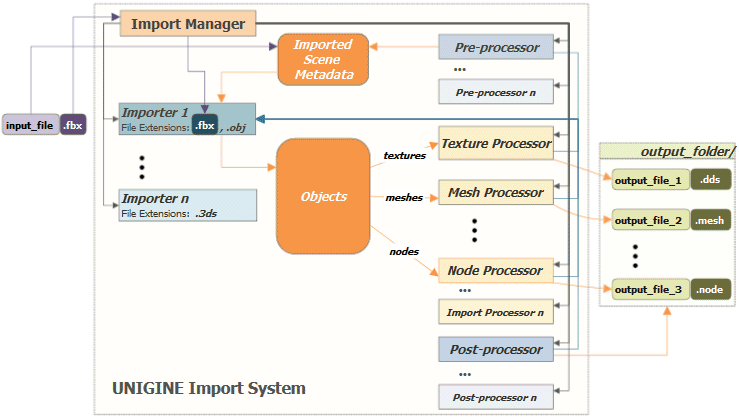 Each importer has a set of parameters that control the whole import process (e.g., scale multiplier, use of various processors such as static mesh merger or vertex cache optimizer e.t.c.). It also has a set of flags defining which scene components are to be extracted and imported. So, the importer should be initialized before use. pre-processor - performs additional operations on scene metadata (ImportScene) and prepares it for the object generation stage. import processor - saves UNIGINE objects, generated by an importer on the basis of metadata, to a file in UNIGINE’s native format. You can use a set of different processors for each scene component or a single processor for all of them. post-processor - performs additional operations with generated files (e.g. copying files to other folders, adding files to packages, etc.). Importer allows you to add any number of pre- and post-processors. However, you can set only one processor for each scene component. The Import Systems offers you the DefaultProcessor - it is, as its name says, a default processor used to save objects, that were generated by an importer, to corresponding UNIGINE file formats (.mesh, .dds, .node, etc.). In case if your application does not require any specific file saving operations you can use the default processor, otherwise, you can implement your own custom processor with any additional functionality. In order to be used, importers and processors must be registered in the system via the Import Manager. You can manage the list of available modules dynamically by adding them to or removing from the registry. When you import a file in any external format the Import System automatically tries to find and use an appropriate importer registered for the specified file extension. Check the extension of the specified input file and find the appropriate importer among the ones registered. Extract scene metadata from the input file, put the data to the corresponding import structures (ImportMesh, ImportMaterial, etc.) and build the import scene. Use pre-processor(s) to prepare scene metadata when necessary (e.g. merge all static meshes into a single one, optimize vertex cache, etc.). Use the appropriate importer to generate UNIGINE objects (nodes, lights, cameras, materials, etc.) on the basis of scene metadata. Use the appropriate import processor to save generated objects to the corresponding files in the specified output directory. Use post-processor(s) to perform necessary operations with generated files. an importer for FBX scenes implemented as FbxImporter plugin, which apart from .fbx format also supports .obj, .dae, and .3ds. an importer for CAD models implemented as CadImporter plugin, which supports .iges, .step, and .stl CAD formats. Custom importing modules (importers and processors) for any file format containing 3D scene data are also to be implemented as plugins. So, you can consider the FbxImporter and CadImporter plugins as examples to build your own custom importing modules. You can also modify and rebuild these plugins to use your own custom importer in the Editor (e.g. add functionality to process used-defined attributes of CAD models, some additional scene processing functionality, etc.). FbxImporter plugin as an a example for your custom import plugin: source/plugins/Import/FbxImporter. CadImporter plugin as an a example for your custom import plugin: source/plugins/Import/CadImporter. Custom Import Plugin usage example to learn the basics of writing your own custom import plugin. File Import Functionality classes for more details on managing the Import System, importers and processors via code (C++, UnigineScript).